The winning bidders were David and Suzanne Booth. David is a Kansas University alumn who has donated large sums to his alma mater and whose family funded the Booth Family Hall of Athletics at KU. As a boy he and his family lived at 1931 Naismith Drive in Lawrence. 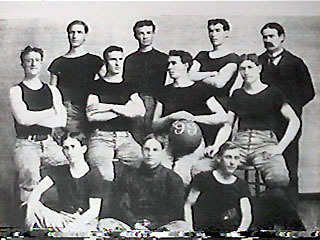 James Naismith founded KU’s basketball program in 1898 and was Athletic Director at the university for 40 years. He wasn’t a great coach, as fate would have it — he was the only coach in the school’s history to retire with a losing record — but he did coach Forrest “Phog” Allen who would one day follow in his mentor’s footsteps as KU head coach and would not only win a lot more, but would go on to found the National Association of Basketball Coaches and become known as the Father of Basketball Coaching. Both men are in the Basketball Hall of Fame in Springfield, Massachusetts, the city where Naismith invented the game. 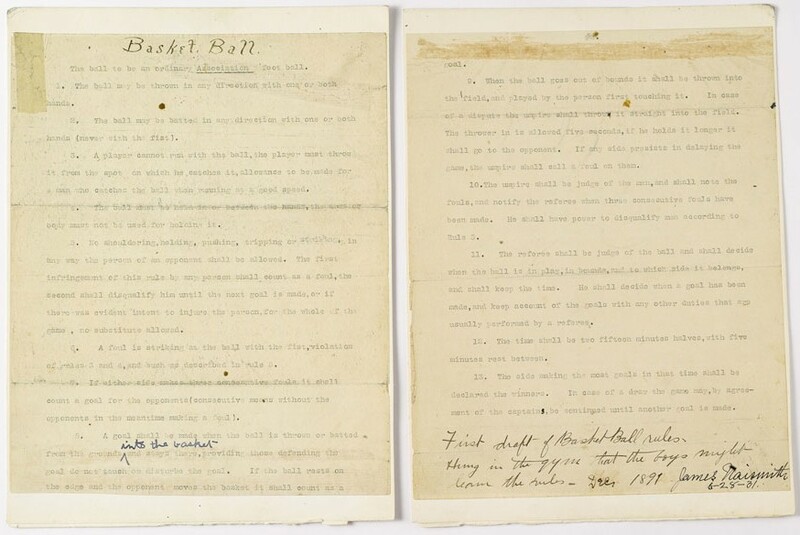 Given Kansas University’s connection to the dawn of the sport, Naismith’s decades of contributions to the school program and Phog Allen’s prominent role in the development of basketball, Booth felt strongly that the original rules should get pride of place at KU. Booth said he spoke with KU basketball coach Bill Self on Thursday and again Friday, after making the winning bid. Also a factor in Booth’s decision to bid aggressively was Phog’s grandson, Mark Allen, who researched the rules to be sure they were authentic and who helped persuade Suzanne Booth that they were worth the inevitably huge expenditure. The seller Ian Naismith, James’ grandson, will give the proceeds (about $3.8 million after expenses) of the sale to the Naismith International Basketball Foundation, a non-profit organization that promotes sportsmanship, integrity and fair play and provides services to underprivileged children. This entry was posted on Sunday, December 12th, 2010 at 10:59 PM	and is filed under Modern(ish), Treasures. You can follow any responses to this entry through the RSS 2.0 feed. You can skip to the end and leave a response. Pinging is currently not allowed. It depends on what kind of a fan you are. If i’d have the money i’d buy it. Sure. That’s the case with everything that’s for sale, I suspect. If you want it and you can afford it, you get it. But alas, I am not made of millions, so….